Viewing 24 of 241 items. 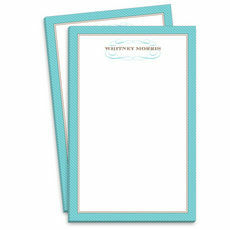 This jumbo size notepad makes a great gift. 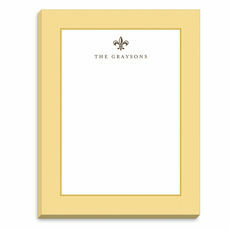 This padded notepad measures 8.5" x 8.5" and includes 200 sheets. Flat printed in ink color as shown with your choice of typestyle. Positioning only as.. Tailored and sophisticated! 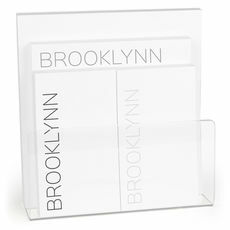 These notepads come wrapped in cellophane with a coordinating ribbon and are ready for gift giving. Flat-printed in black ink on high quality paper in your choice of pad.. Exclusive to The Stationery Studio! 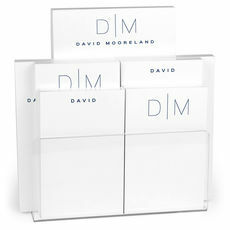 A 2-Pad Set in White or Ecru Paper. Enjoy 100 sheets per pad. Set includes 2 pad which are 5.5" x 8.5". Total 200 sheets. All pads printed with same..
Sophisticated and elegant. 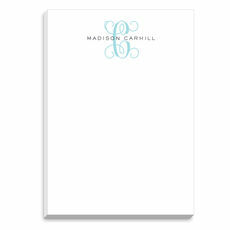 A contemporary border design will show off your style on this huge 300-sheet notepad. Size of sheets is 5.5" x 8.5". 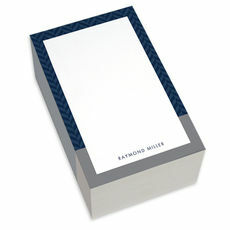 Flat printed using typestyle, ink color and..
Blue Diagonal Striped Border with Name Fleurish Notepads featuring 50 sheets per pad. 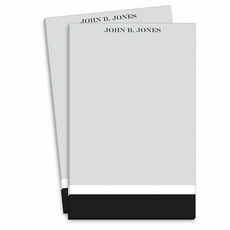 Set of 2 notepads with size of sheets of 5.5" x 8.5". 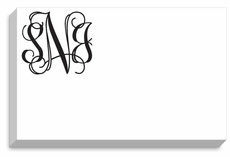 Flat printed in ink color as shown with typestyle of your.. The spotlight is on you! Your last name is emphasized on each pad as shown. 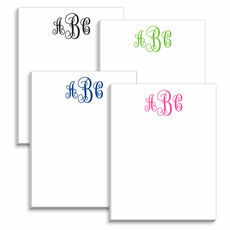 Four pads of 100 sheets per pad printed on your choice of paper color! Total of 400 sheets. 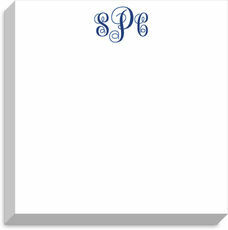 Two pads are 5.5" x 4.25..
A set of 7 personalized notepads of 100 sheets each with a white wrapped holder. There are a total 700 sheets in set. The sizes include 2 pads that are 3.2" x 5", glued on the top; 2 pads.. Exclusive to The Stationery Studio! Set of 700 total sheets! Two lines of text are available for this tablet set. You must provide all the text that you want to appear. The top line will be smaller..
A perfectly adorable gift for you or a friend. 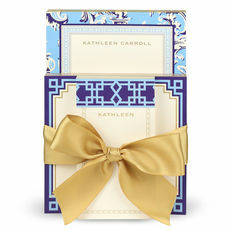 The pads come wrapped in cellophane with a coordinating ribbon and are ready for gift giving. 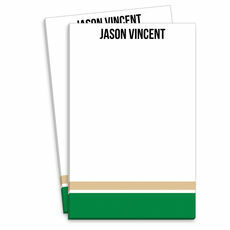 Flat-printed in black ink on high quality paper in your..
Personalized notepad sets make thoughtful gifts for Administrative Professionals Day. They are also great gifts for birthdays, holidays, Father's Day, and Boss's Day. 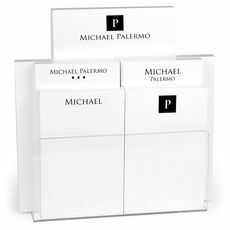 Our extensive selection of notepads in many different sizes, shapes and colors provides the opportunity to select customized gifts to thank those who keep your office running smoothly and to those that you care most about. 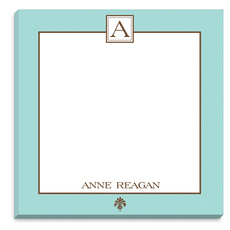 Personalizing the gift with a monogram, initials or name adds a special, customized touch that the recipient is sure to enjoy. 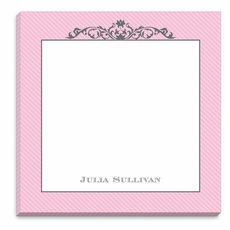 A personalized notepad or a notepad set makes a wonderful gift for your secretary or assistant. 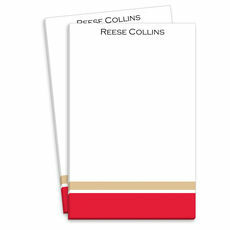 Fun, casual notepads are available in many bright ink and paper colors to add a touch of whimsy to the note writing in your office. 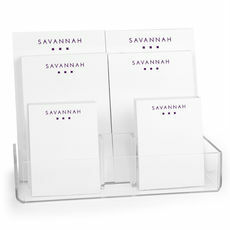 Our formal notepads are ideal for office correspondence or note taking, and many of our notepads are available with an acrylic holder for display on a desk. Many different scripts and fonts are offered, so you can choose a casual or formal personalization design that's perfect for each employee. 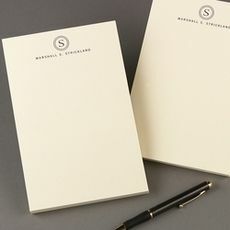 Many of our notepads are available with white or ivory paper and include the option of personalization in a variety of ink colors on the cover or pages. 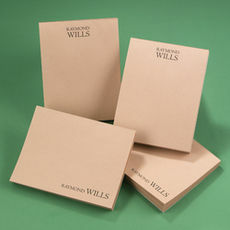 Decorative images and embossed personalization options are also available for many notepads to provide a unique, appealing look. 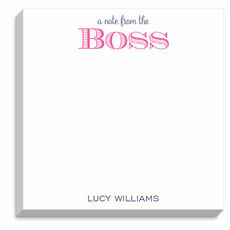 Choosing a notepad collection can give the administrative professional who receives your gift many useful options. 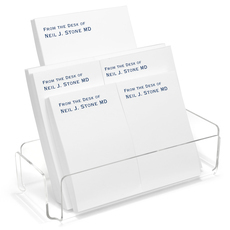 With a variety of notepad sizes ranging from small notes to large memo sizes, our notepad collections are useful at home or in the office and are available with acrylic holders or metal baskets for display on a desk.